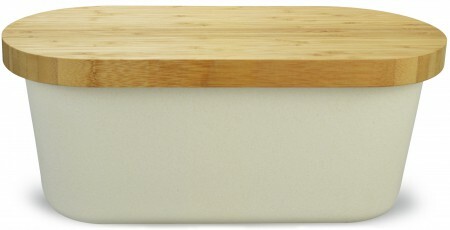 The cover is natural bamboo made bread cutting board with grooved crumb catchers. Fresh, nice, natural texture appearance. Biodegradable and Eco-friendly. Note: Bread box but not the cutting board cover is dishwasher-safe. 100% satisfaction guarantee, 100% worry-free guarantee. This Eco-friendly bread bin features simple design, works seamlessly in any modern, contemporary or vintage kitchen styles. Holds and keeps baguette, bread, bagels, snack bars fresh, moisture-free and organized.